Good Me Bad Me is the story of Milly, formerly known as Annie, a 15-year-old whose mother Ruth is a serial killer. After years of horrific abuse and witnessing the murders of several small children, Milly has finally summoned up the courage to report her mother to the police and now finds herself in foster care with a new identity as her mother awaits trial. Milly's affluent, middle-class foster family seem to have a few problems of their own, and their daughter Phoebe - unaware as she is of Milly's background - is determined to make the new arrival's life a misery. Milly's biggest fear, however, is still her mother - and the permanent psychological damage this monstrous woman has done to her. 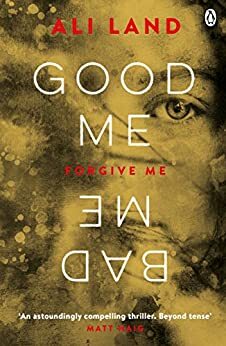 As you've doubtless guessed, Good Me Bad Me is a dark psychological thriller. It's an intense read and the darkness is pretty relentless. Although we're spared a lot of the details of Ruth's crimes, the hints we're given are enough. Milly is plagued with nightmares and suffers dissociative episodes, all of which feels quite oppressive to the reader. Despite the backstory of Milly's mother and her crimes, I personally found it most depressing to read about the bullying at Milly's school, which is mainly driven by her foster sister Phoebe and her vile friends. It's frustrating and not entirely logical that Milly has seemingly been capable of reporting her own mother for murdering nine children, but doesn't feel able to tell anyone that her foster sister has bullied her and at least one other girl in ways that would not only see any child excluded from school at the very least but which are are also serious criminal offences. Although the nature v nurture debate at the heart of this book is an interesting one and I did want to find out how the story would unfold, I was frequently annoyed by moments that were jarringly unrealistic. For instance, I think it highly unlikely that a teenager undergoing intensive therapy for PTSD after witnessing her mother torture children and being forced into the cellar where their bodies were hidden would be encouraged to go on a school trip to the London Dungeon. Neither do I think a secondary school would provide for its pupils an unmoderated online discussion forum on the school's servers for which a single pupil is allowed to set the password and to which no staff are given access, and on which girls are therefore able to post stolen pictures of their naked underage classmates and orchestrate major campaigns of harassment. It just stretches disbelief too far. The basic premise of this book is fascinating, but I saw the ending coming almost from the start and there were no real surprises. I didn't feel that any of the characters really grew or developed or that the subject matter was really explored in full. The court room scenes didn't feel as tense as they should have done, given the build-up to them, and lacked a little realism here and there. This was a diverting read and I didn't consider abandoning it, but ultimately it just didn't have all the elements I was hoping for.